Monica Grant is dead-set on starting a free children’s clinic in Sonoma, California. She has worked as an Emergency Room nurse but wants to make an even greater impact. She prides herself on her ability to read people. When she starts feeling like someone is watching her, she can’t hide the sense that something is wrong. When she starts getting threatening gifts, photos, and letters, she knows that someone is willing to kill her to stop her from opening a free clinic. When the first gift arrives, Shawn O’Neill, a former border patrolman, recognizes the quote from the gift; his sister’s stalker must be the same stalker. His sister had planned to open up a free clinic in the LA area but after receiving numerous threats, she had committed suicide. Shawn suspected his sister had been killed by a colleague of his sister’s who just happened to be a would-be investor for Monica’s free clinic. Who would do this? One of her investors? Can Shawn keep Monica safe from danger without losing his heart? Can Monica keep her dreams alive without risking her friends, family and investors’ lives? Can Monica bear to give her heart to Shawn, whose job requires him to dash into the line of fire? Can Monica and Shawn trust the Lord to protect them and trust Him to heal their broken hearts? Stalker in the Shadows is a great little mystery suspense in itself. 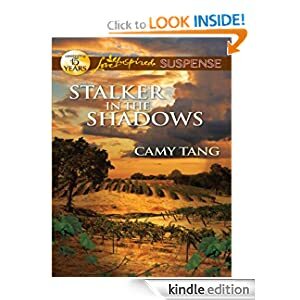 I might be biased since I’ve read all of Camy Tang’s books, but I really enjoy them! Since this is a Love Inspired – Suspense book, it’s shorter in length but it’s perfectly paced. I didn’t want to put the book down, and I really didn’t have to. I have read the previous books in the series and was happy to see where the other characters were at. I love how Tang’s characters have real-life issues and have to deal with them in an authentic way. Don’t be fooled by the fact that it’s a Love Inspired book; it’s worth the read! Thanks so much for the review, Kimberly! I’m so glad you enjoy Stalker in the Shadows! The character Nathan Fischer, who appears in this book, has his own story coming next year, titled Narrow Escape (I just got the title a few weeks ago)!